Among the many spires of Salzburg′s Old Town, the one of the Neue Residenz or New Residenz Palace is particularly impressive. The New Residenz was the "guesthouse" of the Prince Archbishops and home to their collection of maps, library and globes. In the course of the Napoleonic Wars, both Residenz palaces were plundered by Bavarian troops and left with essentially no interiors. Today, the New Residenz is home to the Salzburg Museum, the city′s town museum. 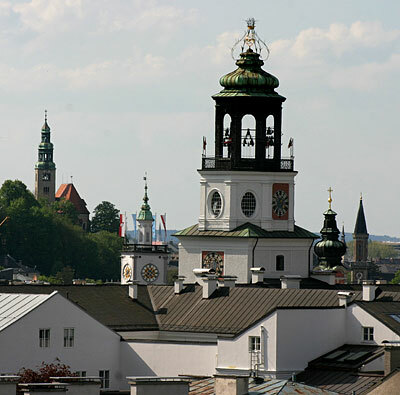 Since its recent refurbishment, the building is even more attractive - and so is the famous Glockenspiel in its tower.